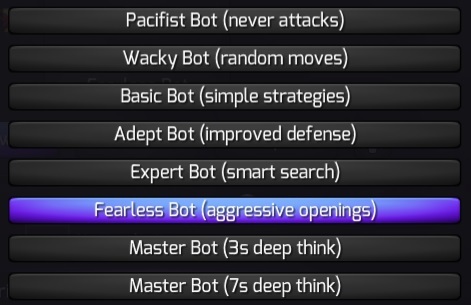 Many of these new personalities will show up as opponents in our new Casual Match queue, which features unranked games against skill-appropriate human and bot opponents. Casual Match mode also includes rewards for accumulating wins. Moreover, wins in Casual Match will accelerate players through the early tiers of the Ranked Play system. The aforementioned features are all implemented and fully functional. The update itself was scheduled for deployment by the end of January, but unfortunately, we’ve spent much of the last week mired in platform-specific technical problems that came up in QA and are currently delaying the patch’s release. A key problem: the large opening books create headaches due to the way our AI interacts with the rest of Prismata. In desktop Prismata builds, the AI runs in a separate process that communicates with Prismata via standard input/output pipes, and the opening books are sent to the AI via these pipes (not because it is necessary or optimal to do so, but because it was a simple, convenient way to set things up when the opening books were fairly small). With larger opening books and more complicated AI configurations, we’ve encountered pipe overflows that break the bot, buffer exception crashes that kill Prismata entirely, and pretty serious lag when starting up the bots. Fixing these issues is not terribly difficult; it’s mostly just a matter of improving our own infrastructure. However, it does take a bit of time to implement all the fixes and test them, so we thank you for your patience! More info on the new patch is coming soon!